My career started in the restaurant business at the young age of eight, washing dishes at my father’s Drugstore Soda Fountain and Dinette. Soon after I went to work for Max Lerner, at Max’s Bakery and Pastry Shop. While there Mr. Lerner apprenticed me, teaching many of the aspects of the baking and pastry industry in the late 60’s and early 70’s. I then went to work for CORAL Management services as head of their baking operation. We provided baked goods from a commissary style environment to over 80 hospitals, nursing homes and ambulatory care facilities. After graduating from the Culinary Arts program at Johnson and Wales University in Rhode Island, I soon went to work teaching baking and pastry classes for a high school Culinary Arts Vocational program for the Mesa Public School system. Soon afterwards my program split off to become a Career and Technical program at the East Valley Institute of Technology (EVIT). During my 30 plus years I have been teaching at the school, it afforded me the ability to take an active part with my areas ACF chapter, and my local community. I am a graduate of the Mesa Leadership Training & Development program. I served on two city boards, was a loaned executive for the Mesa United Way, and served as President, Secretary and board member of my Temple for over 15 years. During my tenure as an educator we were able to host, a Chef of the Year dinner, many local chapter meetings, and fund raisers, thus involving my co-teachers and students with the local ACF chapter. Part of my teaching duties has involved being a co-coordinator for our schools ACFEF Certified Secondary program, training students for ACF, C-CAP (Careers through Culinary Arts Programs), SkillsUSA and FCCLA competitions. All which have produced many winners. My program was awarded the Arizona CTE Program of the Year in 2004, and I was a top 10 finalist for Arizona Teacher of the year in 2006. I have been an active member of my local ACF chapter, for many years. 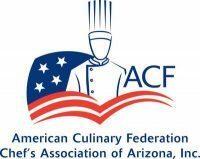 First the Resort and Country Club Chefs Association, which was later merged into the Chefs Association of Arizona. I first became certified in 2002 as a CEPC, then as a CCE. I have also been an ACE for the last four years. I am now serving my second, two year term as the chapter President. In the past I have held the position of Apprenticeship Coordinator, Educational Chair, Secretary, and Vice President. I have been nominated three times for Chef of the Year, and was selected in 2004. In 2011, under my leadership I co-hosted, and oversaw the Western Regional Conference, was appointed to serve on the Knowledge Bowl Committee, and was a member of the CCE Job Analysis Project. I have served for the last four years as Chair and Co-Chair of the Robert Bland Culinary Salon, an ACF sanctioned competition. Now as the current Western Region Vice President I hope to continue serving the ACF, to meet the needs and demands of todays Culinary field.